En modern lägenhet - Otroligt plats, elegans och charm! Lägenheten är modern och elegant ligger i en historisk byggnad. Otroligt plats, elegans och charm. Sublime fusion mellan modernism, god service och effektivitet med en antik smak. En vistelse på Ottoboni Flat ge både turister och affärsresenärer både möjligheten att uppleva atmosfären i en autentisk 1700 romerska lägenhet. En unik och unrepeatable upplevelse i en extraordinär miljö i hjärtat av eviga Rom. Placeringen av Ottoboni Flat är helt enkelt superlativ; i Via della Vite med fönster på Via del Corso, pulsåder i den historiska stadskärnan. Mellan Fountain of Trevi och Pantheon, Piazza Navona och Spanska trappan; fyra väderstrecken, fyra romerska härligheter, förlägger bland dem mest uppmärksammade i världen, alla nås inom en 5 till 10 minuters promenad. För affärsresenären att komma runt är verkligen lätt. I Largo Goldoni eller Piazza San Silvestro, nås på bara 2 minuter till fots, hitta taxistationen, medan det i Piazza di Spagna hitta tunnelbanestationen linje A, centrumaxel över hela staden. Slutligen, många busslinjer som körs i båda riktningarna på Via del Corso. Den senaste renoveringen lägga till en touch av dyrbart. Lägenheten rymmer upp till 4 personer tillsammans i sovrummet och vardagsrummet. På begäran är det möjligt att ha en extra säng (sänglinne ingår). Lägenheten är inredd med fullt utrustat kök och badrum med dusch. Och inte saknar alla bekvämligheter som behövs för avkoppling efter en intensiv dag; Luftkonditionering, TV, satellit, DVD, internet. Köket är fullt utrustat med husgeråd och all köksutrustning som behövs för att laga mat som kan avnjutas i antika väggarna i en lägenhet där modernism och historia kombineras harmoniskt. We stayed in this wonderful flat in early October. Before - and during our stay, communications with Nicola were excellent - Maridol greeted us on arrival and provided a tour of the facility, as well as directions to the market and taxi stand. This beautiful flat more than met our expectations, very clean and comfortable. The location is fantastic, it was so nice to be able to walk just about everywhere - truly located in the heart of the city and everything we wanted to see and do. We are happy to recommend this location - and the elevator is a bonus!! Perfect apartment. Perfect location. Will definitely rent there again every time I come to rome!! Perfect location for travelers who want to be able to walk everywhere! The Ottoboni Flat is located on the corner of Via della Vite and Via del Corso, a very major street in Rome! We walked to the Spanish Steps the first afternoon and they enjoyed a bus tour of the city the next morning. After that -- we walked everywhere: the Coliseum, St. Peter's Square, Trevi Fountain, the Pyramid, and to all the sites in between.. Although the flat is located above a very busy street, the window shutters allowed us to close out most of the noise. If it bothers you -- take ear plugs! The Coop market is within 2 blocks, has everything you will need, and the employees are very helpful. Although the twin beds are located upstairs, we utilized the fold-out sofa with a very comfortable and firm mattress. Mauro and Daniela were very helpful with our arrival arrangements and in orienting us to the flat and the area around the flat. My friend and I just returned from a week long stay in this apartment. We had a wonderful time and can highly recommend this property. The location is great and the price is very fair for what you get. The management is wonderful to work with, and respond quickly to any concerns. Oh, and my girlfriend says the ladies needn't worry about the bathroom as it is more than adequate! Thanks for a great time! Great location, centrally located, and safe! 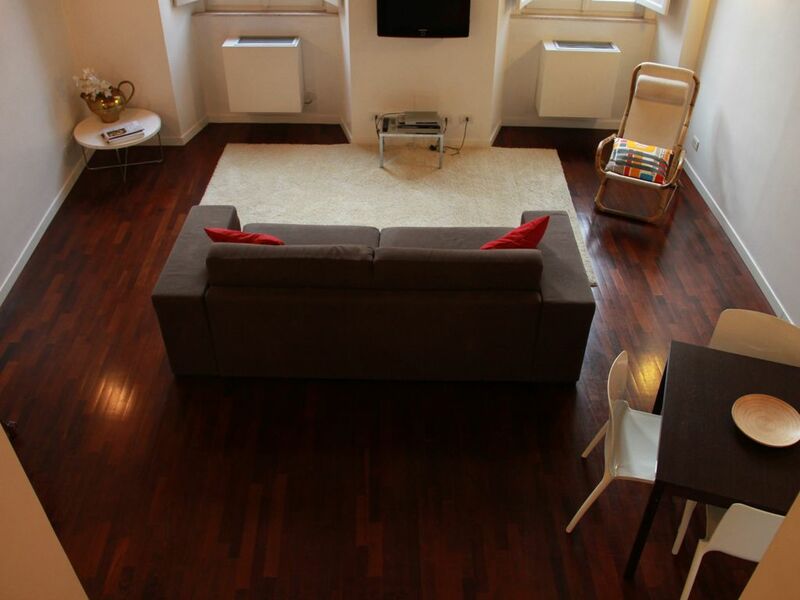 This apartment is located just off a very Main Street in Rome, and close to everything! We never used transportation because we were able to walk to all the sights!!! Landlord is very accommodating to any of your needs, and prompt to respond. Living room is very spacious, in fact, one of the largest of all the apartments we stayed at while traveling throughout Italy! Be sure the elevator is working , as this apartment is on the 3rd floor. If you are looking for location, you need to look no further! I truly recommend this flat. Great location and cleanness! Walking distance to the best locations in town. Guillerme, thank you so much for taking the time to write a nice review!